From luxury smartwatches to Virtual Reality catwalks at Fashion Weeks, major fashion influencers and retail brands like Topshop and Dior are adopting technology to increase their scope and profits. There is a potential revolution in the way fashion items are marketed and sold, and major players like Dior, Topshop and Balenciaga are already embracing virtual reality technology to take part. At Topshop’s flagship store in Oxford Circus, fortunate customers were given virtual reality headsets to witness the AW14 catwalk show. Broadcasting the runway show in 360 degree virtual reality allowed for first row access next to celebrities like Kate Moss, Anna Wintour. The company’s global marketing director, Sheena Sauvaire said “we couldn’t have asked for better results” after several hundreds of people watched the show soon after it came out. Other well-known fashion brands are racing to get involved in VR as well. For example, Dior created its own VR headset and Balenciaga streamed its catwalk show in VR. As these brands start utilizing VR, it won’t be long until others do as well; that is, if they wish to not fall behind. According to a research by Gartner (a leading information technology research company), wearable devices sales will generate a total revenue of $28.7 billion in 2016. By 2017, there will be about 323 million units of wearable tech devices worldwide. So how do these numbers transfer to the business of fashion? There is a growing market for stylish wearables, and major fashion retail brands are already tapping in. 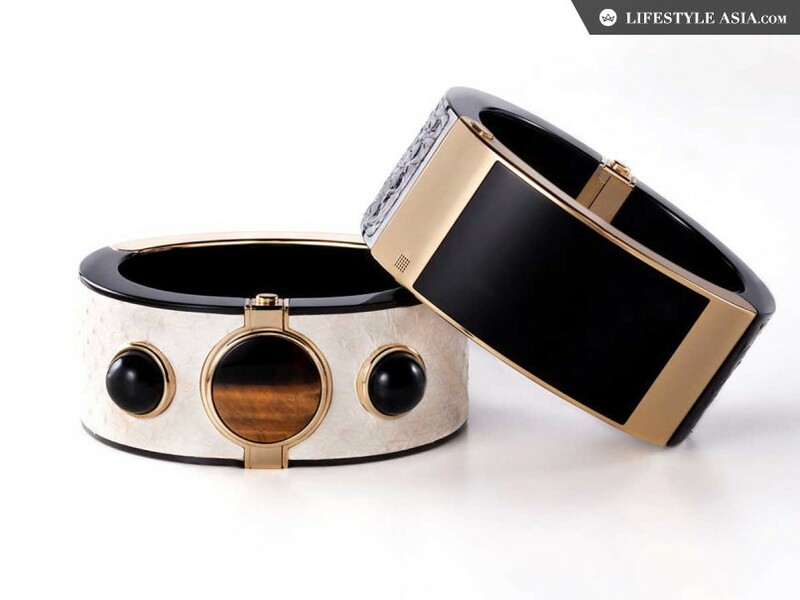 For example, Tory Burch’s work with Fitbit showed a significant improvement in fitbits’ aesthetics, while Opening Ceremony and Intel collaborated to create a beautiful smart cuff bracelet that sold out at Barney’s. In fact, even Apple has collaborated with Hermes, also increasing its presence in more fashionable and trend-conscious environments through magazines and celebrity endorsements. Even for VR headsets, brands like Dior and Rebecca Minkoff are coming up with their own stylish versions so consumers are more inclined to own and use one. The market for high-functioning, fashionable wearables is growing, and fashion brands must adopt technology in their products to keep up. Fashion retail business leaders are confident that virtual reality will change the way consumers interact with brands. As Tommy Hilfiger’s CEO Daniel Grieder said, “it’s not about turnover by squarefoot anymore. It’s about surprise by square foot, or newness,” and this is where virtual reality comes in. “[With an at-home headset], you can be anywhere — New York or Dubai — and step into a Rebecca Minkoff or a Barneys or another branded shop and get the store experience with the headset,” said Uri Minkoff, the CEO of Rebecca Minkoff, also commenting that he sees this replacing the classic e-commerce platforms in the future. Virtual reality indeed seems to be the perfect, refreshing way for brands to directly engage with consumers. Are you tired of having to try on ten different outfits just to check that they fit right? The process of waiting, going in and out of fitting rooms to change can be irritating and time consuming for both consumers and fashion retail stores. Luckily, augmented reality and virtual reality can be the solution. Virtual reality mirrors can record one’s measurements and display clothing items on a virtual version of yourself, an experience that offers “convenience for shoppers and data for retailer” according to Tamara Sender, a well known UK fashion analyst. Through virtual fitting, customers can view different outfits with simply a swipe of the hand, and the retailers can keep measurements on file to ensure the perfect size every time. In addition, VR allows designers to better create new products by getting an immersive 360° look at the clothes that they are creating. As sales of VR headsets are forecasted to reach 22.5 million units for non video game playing consumers by 2018, there is great potential for people to see exactly what they would look like in certain outfits right from their homes. Overall, virtual reality is a booming segment in digital marketing, and it is quickly establishing its place in all sectors of the fashion retail business, from store experience and marketing initiatives to overall enhancement of customer experience. Its adoption is not in question anymore -- it’s a question of how quickly and effectively fashion retail brands can implement virtual reality to engage modern day customers. The wave of virtual reality is shaping the future, and now is the perfect time to hop on board.